Quick and easy, these vegetarian Mexican topped potatoes are ready in under 15 minutes! 1. Pierce the potatoes with a fork. Place on microwave-safe paper towel in the microwave. Microwave on High for 5-7 minutes or until tender, turning and rearranging potatoes once halfway through cooking. 2. Meanwhile, mix the frozen vegetarian mince, salsa, chili powder and water in a medium saucepan. Bring to a gentle simmer and cook over a low heat for 4-5 minutes or until thoroughly heated, stirring occasionally. 3. To serve, cut the potatoes in half lengthwise and mash slightly with a fork. Spoon the mixture over potatoes and top each with 1 tablespoon soured cream and a few chives. • Great served with grated cheese, coriander, spring onions, tomatoes or chopped pepper. • Easily doubled or tripled for extra guests. 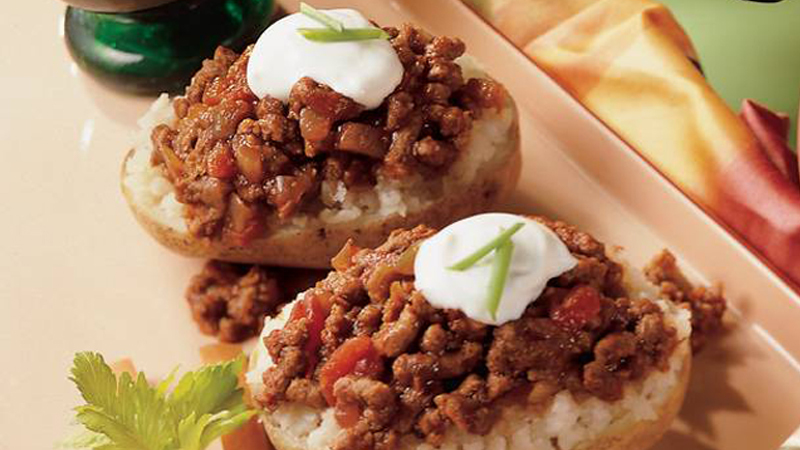 • Recipe Variation For a vegan version, omit the sour cream.